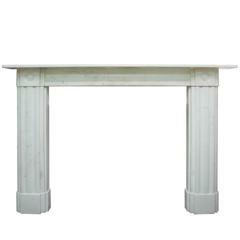 A beautiful early 19th century, circa 1811-1820 statuary white marble chimneypiece surround. 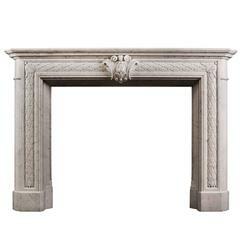 This fireplace is English made and hand-carved in Italian marble with French influence of the Louis period. Recently restored after many years in storage. This truly is a fine example of the period and craftsmanship. Shelf width 70 3/4" 179.7 cm Shelf depth 13 1/2" 34.3 cm Overall height 46" 116.8 cm Opening width 46" 116.8 cm Opening height 35 1/2" (Center) 90 cm Opening height sides 37" (Sides) 94 cm Rebate 7" 17.8 cm. 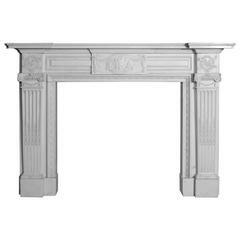 Early 19th century antique Regency statuary white marble fireplace surround, with roundel carved capitals above fluted legs and frieze, circa 1810. This set is in good condition. 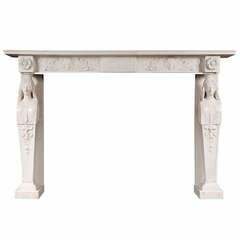 Centre tablet height 15.5 x 35.5 cm End block height 13 x 13 cm Depth 2 cm for all Weight 5 kg.